The trend is your friend, but maybe not when it extends to meet a secular downtrend. 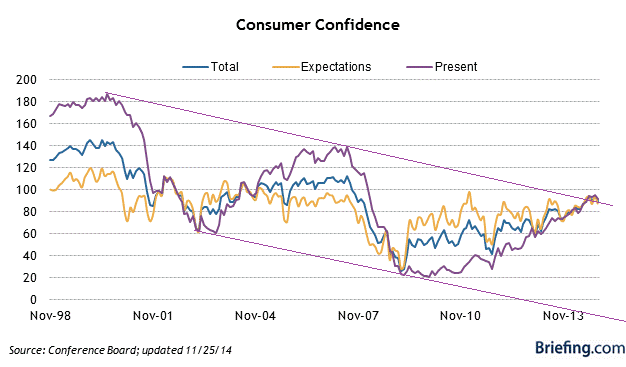 That’s what the Consumer Conference Board’s Consumer Confidence (aka the ConCon Con) Index showed today. It shocked Street conomists, whose consensus guesstimate was a reading of 96. Instead it came in at 87. I see little value in this number. While the secular trend has been down for 14 years, reflecting ever worsening conditions for an increasing number of Americans, over the short to intermediate term the index follows stock prices. If memory serves, wasn’t there a sharp market break in October that had everyone in a panic? I suspect that this influenced the “consumers” who were surveyed by the Conference Board in early November. The mainstream media dutifully reports this number as if it means something in the short run, and even occasionally will post a chart that goes back a few years showing the uptrend in place since 2009. But you almost NEVER see a long term chart in the Wall Street Journal, on Bloomberg, or CNBC. Gee I wonder if they’re trying to con us? We should also note that the last two peaks in 2000 and 2007 coincided with stock market tops. Does slightly breaking this trend mean that we’ve broken out? Or is it just a little overshoot, a final burst of “optimism” before the secular trend reasserts itself. If the Con Con Con drops below 86 next month, that could be the ringing of the bell. We need not ask not for whom the bell would toll. It would toll for us.